Experience the rivers of Alaska in a technologically advanced environmentally controlled jet boat, created to safely local navigate rivers. This gentle ride takes you 20 miles up and back on the Susitna River enjoying the splendor of Alaskan river beauty and nature. 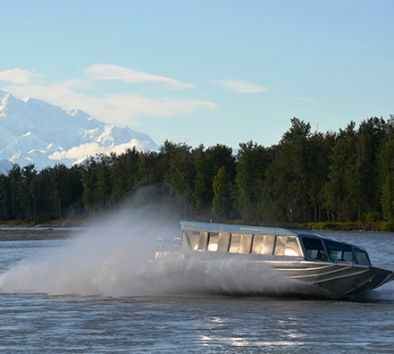 Your naturalist and Captain will talk about the local glacial fed rivers & explain their Alaskan names, as well as offer a panoramic view of Denali. Also discussed will be the life cycle of our local salmon and various wildlife that consider our area home. Step ashore and take a leisurely ¼-mile stroll and visit an authentic trapper’s cabin, and a recreated encampment of the Dena’ina Indians, the area’s original inhabitants. Your naturalist will acquaint you with the wildflowers and plants that grow in abundance along the river system and you will learn about the edible plants that were used by the Native Indians for cooking and medicines. Wear comfortable walking shoes. Dress in warm layers. Bring a camera. Wildlife sightings are likely but not guaranteed. Tour will operate rain or shine. Tour operates subject to meeting a minimum number of participants. Depending on the number of participants, our local tour operator may opt to operate tour with a smaller jet boat with no restroom. Tour takes place in Talkeetna.